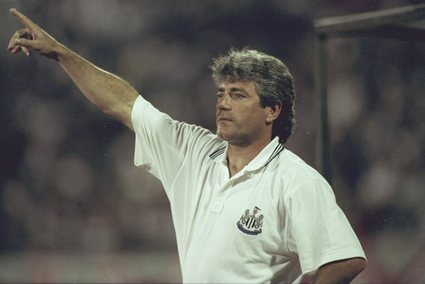 King Kev had delivered the most exciting brand of football and nearest glimpses of silverware that Newcastle United fans had known for decades. His surprise resignation in January 1997 sparked scenes bordering on bereavment on Tyneside. Old Big ‘Ead might have worked miracles with Derby and later Nottingham Forest, but having arrived at Leeds United promising the Earth and the reputation of being one of the best in the business he left Elland Road after just 44 days. He had apparently managed to instigate a players’ revolt in his short tenure! Being football’s softly-spoken, articulate manager comes with its downsides – it makes you a bundle of nerves. Coppell lasted just 33 days as Manchester City boss in 1996 before quitting. He cited severe stress for his short stay saying he had been overwhelmed by the job. A token representative from Real Madrid, whose seasonal tendancy to advertise for situation vacant is as predictable as Argos’ before the Christmas rush. Capello, now famously, delivered the first La Liga title in four years to the Bernabeu only to be dismissed. Guided Juventus through their bad times as he secured immediate promotion from Serie B after their demotion. Having done so, he immediately quit. He is now one of the favourites to get the Chelsea job. Which brings us neatly to the man of the moment. Tensions have obviously been running high between Mourinho and Roman Abramovich for some time now, but they seemed to have patched up the worst of their problems. Obviously not. Bassett the manager has always had a reputation as a wheeler dealer and a bit of a wideboy, so you would have thought that during his four days in charge of Crystal Palace in 1984 they would have considered getting him to sign a contract. He walked out to become Wimbledon manager again. Ouch! In 2002, O’Leary’s greatest offence seemed to have been writing a controversial book on Leeds United. The performance of his side on the pitch had seemed outstanding. Of course, we now know he had proto-Abramovich financial backing but his exit still came as a shock at the time. Following a successful spell in charge of Wimbledon in the mid-1990s, Kinnear suffered a heart attack and was forced to step aside to make way for the wellies of Egil Olsen. The then Arsenal manager was banned from football for a year in 1995 for taking bungs from Norwegian agent Rune Hauge bringing his spell at Highbury to a sudden halt.